Adilabad Eparchy comprises of the civil district of Adilabad, the northern most district in Andhra Pradesh. This area was under the jurisdiction of the Eparchy of Chanda until July 1999 when it was constituted as a new Eparchy by Pope John Paul II through Papal Bull ?ad aptius consulendum? dated 23rd July 1999. 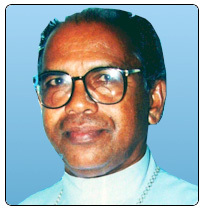 The first bishop, Joseph Kunnath CMI was appointed by His Holiness through ?Quoniam oportet? of the same date, and was consecrated on 6th October 1999 on which date the new Eparchy came in to existence. The district is located between 77 and 80 degrees of the Eastern longitudes and 18 and 19 degrees of the Northern latitudes. Its Southern boundary is the River Godavari, and East, West and North is the State of Maharashtra. The contiguous Eparchy are Chanda in the North and the East; Amaravathi in the West and Hyderabad and Warrangal in the South. The total area of is 16210sq.kms. Fr Prince Anatony Panengaden was appointed the second Bishop of Adilabad on 6 August 2015. He will be consecrated and installed on 29 October 2015. Bishop's House, Mancherial, Adilabad Dt., A.P.